The LaCie 5big Thunderbolt 2 Hard Drive 30TB delivers Thunderbolt 2 speeds for 4k video editing, with RAID 5/6 for no-compromise data security. With this kind of speed, videographers can work directly from RAW files in Apple Final Cut Pro or Adobe Premiere get maximum quality from footage, and see edits in real time. No need to first convert footage into a lower resolution. Avid Pro Tools users will notice incredibly smooth audio mixing, even when working with hundreds of tracks simultaneously. Professional photographers using Adobe Lightroom or Apple Aperture can browse through archived libraries of thousands of RAW and edited images with zero lag. The 40 TB version features Seagate Enterprise Class hard disks that provide superb accessibility, reliability, and robust performance. Designed to operate 24x7 on 16-bay racks (instead of 8x5 operations for traditional hard drives), these HDDs can support 8,760 hours of operation per year for extraordinary availability. The LaCie 5big with Enterprise Class drives also comes with a five-year warranty that covers drives, enclosure, and spare parts, ensuring a solid, long-term investment. Enterprise Class drives feature 256 MB cache, 7200 RPM, and rack environment optimization, offering the ideal solution for handling aggressive workloads. For maximum reliability of your critical data, depend on the LaCie 5big with Enterprise Class drives. The LaCie 5big offers RAID modes 0, 1, 5, 6, 10, and JBOD. Its hardware RAID controller delivers sustained performance, better flexibility, and the ability to connect the product to another computer while keeping the RAID configuration. Preconfigured in HFS+ and RAID 5, it is truly plug and play for Mac users. And easily customize the RAID mode to suit your needs using the LaCie RAID Manager utility. You could instead choose RAID 0 to maximize speed and capacity for current projects, and then move completed projects to archival storage incredibly quickly. Or, choose JBOD, which allows you to see and use each disk independently. With five working days a week, you can assign each disk to a daily backup. It’s even possible to set up multiple RAID volumes. For example, create both a 3-disk RAID 5 array for current projects, and a 2-disk RAID 1 array for backing up source files and final footage. Thunderbolt 2 also continues to support daisy chaining up to six devices to a computer via a single cable (included in the box). For example, you could connect a total of 36 LaCie 5bigs via the six Thunderbolt 2 ports on a single Mac Pro, enabling more than 1 PB (1080 TB) and more than 3000 MB/s. Thunderbolt 2 even uses the same cables and connectors as first-generation Thunderbolt. The LaCie 5big has a cutting-edge cooling system that ensures long-term reliability by preventing overheating. It consists of three key components: an innovative heat-dissipating aluminum casing, a Noctua cooling fan, and jumbo heat exhausts. For the enclosure, a solid-aluminum heat-sink design diverts and dissipates heat more efficiently than plastic casings. LaCie also bundles the 5big with software solutions for system monitoring, backup, and unauthorized access prevention. Use the LaCie RAID Manager utility to set up email alerts and monitor storage before potential problems escalate. 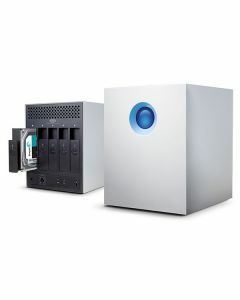 And for professional backup schemes, the LaCie 5big includes Intego Backup Manager Pro and is compatible with Time Machine.